Altitude: It grows between the sea and the first coastal hills and inland to up 970 metres metres above soil level. Habitat: It grows both in sandy hill slopes and on gravelly soil covered with pebbles or boulders, often in rock cracks. In open areas without any surrounding vegetation or among sparse Euphorbia lactiflua shrubs. Other cacti that grow in this area are: Copiapoa marginata, Echinopsis deserticola and Eulychnia breviflora. 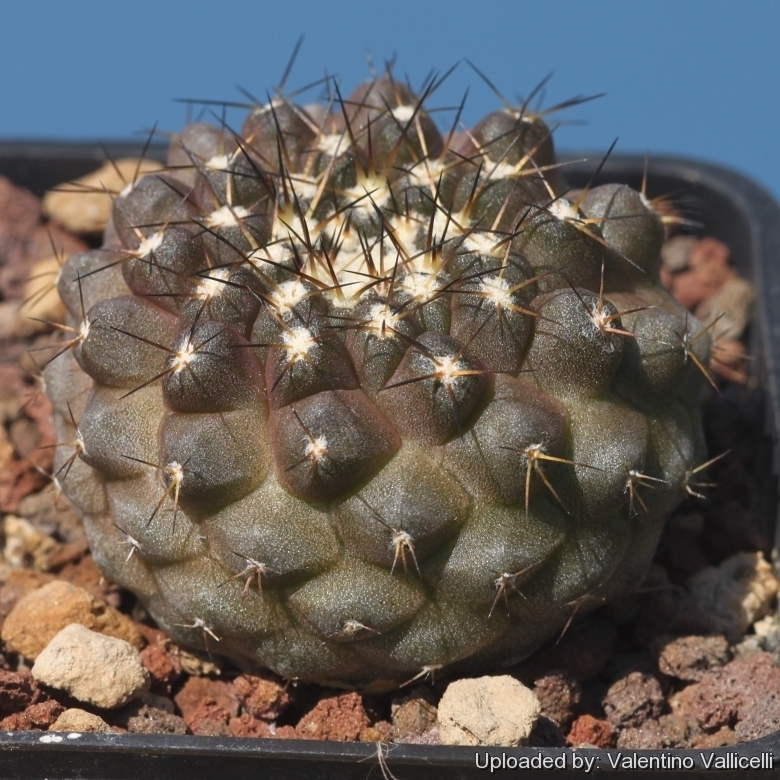 Description: Copiapoa leonensis is the local or morphological form of the very variable Copiapoa humilis from Quebrada el León, Chile (Atacama Region). It is distinguished from the type C. humilis from Paposo for its more firm body and root system (usually quite soft in typical C. humilis). Flowers yellow-orangish. Spines long and stout. Stem: Hard to the touch, 55 mm in diameter (35 to 80 mm) spherical or, sometimes, slightly elongated, grey-green turning pinkish if exposed to direct sunlight. The apex is flat and woolly. Root: Napiform, strong, large up to 150 mm long and 30 mm wide with a narrow neck. Ribs: 11-16, about 8 mm thick and 40-50 mm long, dull, young plants have spiralling tubercles (not arranged in ribs), but the ribs are clearly visible in mature plants. Areoles: 20-30 mm in diameter, woolly when young, later glabrous, slightly depressed 30-80 mm apart. Radial spines: 8-10, straight, needle-like, 50-130 mm long, porrect and radiating in all directions. Central spines: 1-3 slightly thicker, spreading away from the body, becoming dark gray with time. On older areoles, some spines missing. Copiapoa leonensis growing at higher altitudes shows the strongest spination. light yellow 13 mm long. Stigma slightly darker with 7-9 lobes. Stamens parallel, inner ones about 9 mm long and the outer 4 mm long. Fruits: Globular, 5-6 mm in diameter, green. Seeds: 1 mm long and 0.7 mm wide, black and shiny. 6) Ingrid Schaub and Ricardo Keim “Copiapoa leonensis I. Schaub & R. Keim Species nova“ Cactus & Co. 2 (10) 2006. Propagation: Seeds (or offsets if available), Grafting is often used to speed growth rate and to create a back-up to plants in collection. Seeds germinate in 7-14 days at 21-27° C in spring, remove gradually the glass cover as soon the plants will be well rooted (ca 1-2 weeks) and keep ventilated, no full sun for young plants! Cuttings will take root in a minimum temperature of 20° C (but better in hot weather). Cuttings of healthy shoots can be taken in the spring and summer. Cut the stem with a sharp, sterile knife, leave the cutting in a warm, dry place for a week or weeks (depending on how thick the cutting is) until a callus forms over the wound. Once the callus forms, the cutting may be inserted in a container filled with firmed cactus potting mix topped with a surface layer of coarse grit. They should be placed in the coarse grit only; this prevents the cut end from becoming too wet and allows the roots to penetrate the rich compost underneath. The cuttings should root in 2 to 6 weeks.